This is #26 in a series of blog posts about recovering from the Gulf oil spill and from oil dependency overall. The first introduces the series. The Deepwater Horizon disaster in the Gulf of Mexico has a lot of us rethinking our relationship with petroleum. Could we possibly be on the verge of transitioning away from oil dependence? "The time for change has arrived and that change has to involve a transition from auto-dependency and all that goes with it to lower levels of car use and higher levels of accessibility and environmental quality." While Whitelegg pointed out that "the existence of such a critical mass ... does not guarantee that this change will take place in the short term," any change like this has more chance to manifest if it springs from the grassroots. Looking at this today, I can only think that the Gulf oil disaster must have added to the crowd desiring freedom from car and oil dependence. If such a critical mass of people is growing, then small changes such as some of the examples in this series of posts -- as well as the many examples in Divorce Your Car! -- could be components of a bigger shift. Walking school buses, bike delivery services, transit investment, more telecommuters, and efforts to limit sprawl have the potential to add up to a tipping point and a major transition. a couple of employees with parking hassles at work. Starting with some simple actions from these people, this town – today a typical car-dependent community – could soon look very different. Suppose one of the two cyclists notices the teenagers hanging around with nothing to do, maybe getting into a little trouble. This cyclist knows about youth bicycle repair programs such as those at Eugene, Oregon's Center for Appropriate Transport and the Boston-based Bikes Not Bombs. He teams up with the industrial arts programs at local schools to start a youth bicycle workshop. This expands opportunities for the town's teens, many of whom start cycling around town on bikes they've built or repaired themselves. Within a few years, the shop starts a community bicycle sharing program, which gets more townspeople cycling. Our other cyclist decides to start a bicycle delivery service like the one mentioned earlier in this series, Pedal Express. 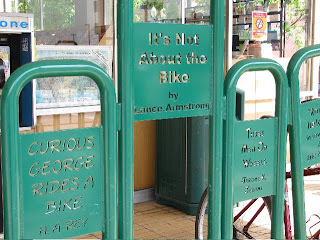 She gets Jim Gregory's book Cycling for Profit, follows its instructions to start her business, and is soon delivering groceries, meals-on-wheels, and other items by bike. Within a few years and as she adds employees, she adds recycling pick-up and a diaper delivery service, featuring organic cotton diapers washed in laundry soap without scents or petrochemical ingredients. 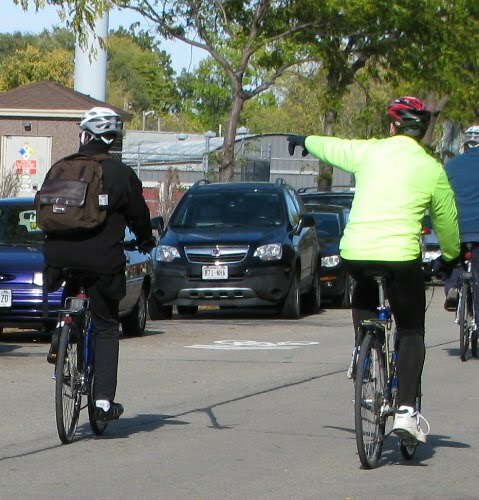 Both these cyclists make bicycling more visible to the town's business community. 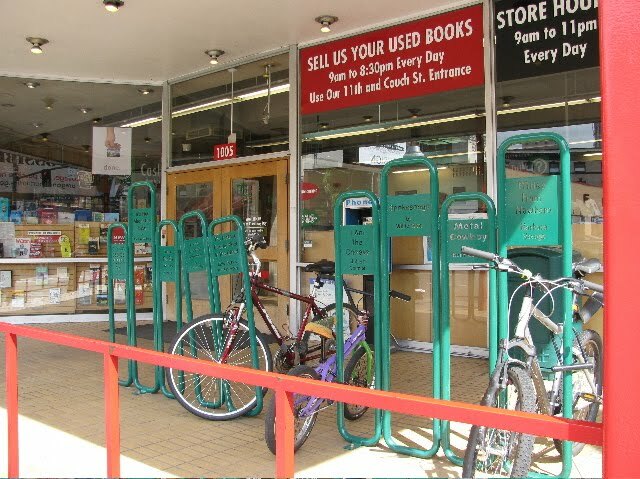 When they suggest better bike racks at area businesses, several stores and offices comply. The bookstore installs racks inspired by the ones at Powell's Books in Portland, Oregon; other businesses even supply bike lockers or covered bike parking. 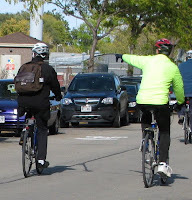 Seeing the bike racks and lockers, another few town residents start biking. On a recent trip through Portland, Oregon, I was delighted to spot these bike racks sporting bicycle book titles in front of Powell's Books (above and below). Meanwhile, our concerned parent reads about Safe Routes to School and Walking School Buses and decides these look like great ideas. He connects with the sympathetic teacher and together, they get the local school to participate in Walk to School Day. 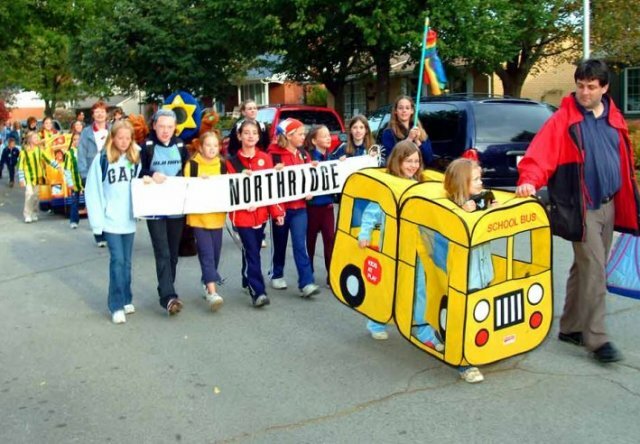 Its success leads the school district to affiliate with Safe Routes to School, and kicks off the organization of several Walking School Buses. Soon, groups of children wearing colorful scarves or caps designating their Walking Buses can be seen around town with volunteer adult leaders who deliver them to local schools. Many of the Walking Bus leaders are retired folks who love spending time with the kids and helping out with community safety. The kids and bus leaders all get healthier and lose a little weight, since they're getting regular moderate exercise on the way to school. Michelle Obama comes to visit and talks about this community as a great example for her Let's Move initiative.